In 1990 I was deployed with Bravo Battery, 2nd Battalion, 1st Air Defense Artillery. Officially, we were equipped with the third generation of the Hawk surface-to-air missile system. However, a handful of us knew that we were also equipped with a second, secret weapon system which used missiles identical to the Hawk but employed a detection, identification and engagement system based on a totally different principle. It was called Alpha and I was only given permission to write about it in 2015. Secrets and Scuds follows Bravo Battery from Fort Bliss to southern Iraq, the misadventures of its soldiers and the Catch-22s of the Army. 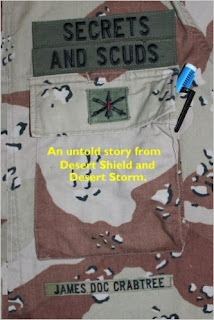 Tent City, Baghdad Betty, an accidental missile launch, scud attacks, IQAF MiG-25s, disguised generators and a close call on a fratricide incident all occupy the pages Secrets and Scuds. Now available on Amazon.com. The book is illustrated with photos by the author and cartoons.